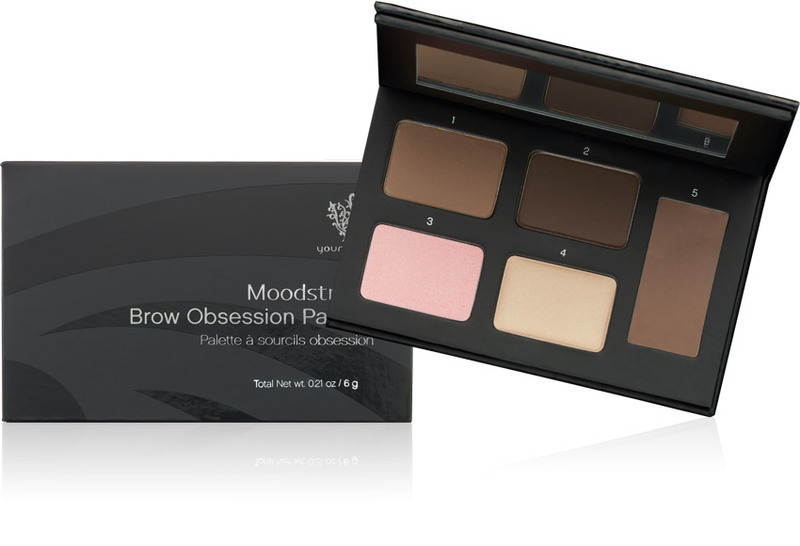 Get brows that wow with the Brow Obsession palette—your secret weapon to a high-impact look. Get five versatile products in one mirrored compact: light and dark sculpting powders, matte and shimmer highlighters, and a wax to keep your brows set to stun. Includes light powder, dark powder, matte highlight, shimmer highlight, and setting wax. Available in blond, brunette, and dark brunette/black shades. Apply the light powder using the angled end of the Brow Artist Brush to fill in brows, paying special attention to sparse areas. Apply the dark powder to outline, define and create your desired brow shape also with the angled end of the Brow Artist Brush. Apply the matte highlighter to brow bone and above the tail of your brow for ultimate definition and brightening. Tap the shimmer highlight with your finger to the inner corner of your eye and on top of the matte highlight on your brow bone for a truly glamorous finish. Apply the setting wax using the flat end of your Brow Artist Brush to groom brows and keep them in place all day.